Altered Beast is a side-scrolling action game in which the hero, a shape-shifting resurrected Roman centurion, must rescue Zeus’ daughter from an evil demon god. Through the collection of power-ups the protagonist grows incrementally stronger before finally turning into a non-human creature with special powers. Once the final shape shift has taken place, a boss battle takes place and the level ends at which time all of the power-ups are lost. This process repeats itself 4 times, after which you will have rescued the kidnapped Athena. 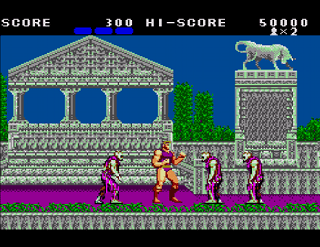 Although not a particularly impressive game on any platform, Altered Beast served a purpose on the Genesis in that it showed that arcade-quality games were possible on a home console (and served as the system’s original pack-in game.) The Master System port of the game seems to have served no purpose other than to give birth to the trend of offering SMS owners inferior ports of games already available for the Genesis – a tradition which continued with games like Sonic The Hedgehog, Shinobi, and Streets of Rage. The controls feel cumbersome and unresponsive, the frame rate is extremely choppy and the game suffers from intense flickering. These problems, along with obvious mistakes such as the text “…rise from your crave…” being included in the intro, give the impression that the game was rushed out the door without a proper quality control process taking place. Sega tried including digitized speech similar to the game’s big brother on the Genesis, but it’s full of static and barely understandable. It takes a lot for me to call a game “unplayable”, but this game clearly falls into that category. Altered Beast for the Master System is a horrible port of an already mediocre game. Buy Altered Beast on GameGavel or Amazon. Tagged Action, Altered Beast, Master System, Review, sega. Bookmark the permalink.